What does a grape arbor smell like? I’ll admit to having experienced only one grape arbor. My Aunt Lois’ Concord grape arbor was so large, it was a ‘character’ at her Virginia home — as interesting as her moody dogs, her army of guardian Canada geese, and her free-range chickens (one of whom would go inside my aunt’s house and sleep in a dog bed by the kitchen stove; Miss Hinny would doze contentedly even as one of her less-beloved kin baked in the oven next to her). My aunt’s grape arbor enclosed a large rectangular plot of land and was made of shortened telephone poles, wooden beams, heavy-duty wire mesh and old lattices. Two Concord grape vines were planted next to, and were supported by, telephone poles at opposite ends of the arbor. The grape vines formed a roof and walls, and during the growing season, one would part the dense leaf-covered vines and enter a dim ‘room’ — an excellent place to hide, to spy on people who worked in the surrounding garden, or to sulk. In spring and fall this grape arbor was pleasant: bright, cool, airy and dry, but in summer, as the temperature soared and the grapes matured, the arbor ‘room’ became stuffy and damp, full of gnats, yellow jackets, and flies. During the hot months, I’d sit outside the arbor and eat delicious ripe grapes; after eating the grapes’ green pulp, I would toss the seeds and purple skins to the chickens gathered at my feet. Some athletic chickens, not content with grape seeds and skins, would jump up and grab whole grapes from the vines. Lazier hens would sit under the arbor waiting for a grape to drop to the ground; sometimes the fallen grapes would be too ripe for even the chickens, so those grapes would rot on the moist earth beneath the arbor and scent the air with the odor of vinegar. Brosius and I had different arbor experiences. While my Southern arbor smelled of ripened Concord grapes, bitter grape leaves, vinegary moist soil, chicken feathers (and worse), Brosius’ Under the Arbor emanates the scents of “crushed grape leaves, weathered wood, green moss and cool earth.” I wanted Under the Arbor to satisfy my desire for a fruity and rustic ‘outdoor’ cologne. 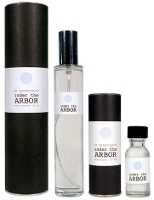 Under the Arbor is a perfume absolute; it is strong and long lasting. Under the Arbor’s tenacious heart note smells like a grape lollipop, not fresh fruit. The sweet grape candy aroma is placed between two layers of harsh notes — a musty opening note smells like brittle, yellowed paper (imagine the scent of a 50-year-old scrapbook) and the base notes bring to mind the pungent scent of wet wormy earth…the type of earth you encounter six feet underground. Under the Arbor is more “In the Attic” on my skin. I remember opening a mildewed leather trunk that had been in my family’s attic for decades — the contents of the trunk (old clothes, books and letters, empty perfume flasks, ribbons and dried flowers) produced a sharp, yet sickly sweet aroma, an aroma that reminds me, overall, of Under the Arbor. With perfume, one man’s Miss Haversham’s wedding bouquet, decrepit and dusty, is another man’s Tahitian blossom by Gauguin — brought to life. CB I Hate Perfume Under the Arbor is available in 15 ml perfume absolute ($55). 2 ml samples are also available ($11). For buying information, see the listing for CB I Hate Perfume under Perfume Houses. Huh. I need to try this! Reactions are all over the place. I think it sounds like something I'd like, but who knows? Kevin, your review reminds me of your earlier review of Acqua della Macchia Mediterranea. Mustiness… decay… earth. Very evocative. You reviews make me want to smell the CB range even more Kevin. I still haven't got round to smelling any. You certainly have a gift for describing fragrances and the stories that you tell with them, give them a very personal touch. Your writing is beautifully evocative of your memories but the perfume sounds just ghastly. Not for me! PBI, just to say there are actually 5 new ones. Really liked Wild Hunt & also forgot to mention to you the I am A Dandelion, which I also liked. Eternal Return & Greenbriar are the others. You'll smell them soon enough. Under the Arbor was too candied for me too. March: made me feel melancholy, depressed…almost instantly. No they aren't available over here in the UK. I keep waiting for CB to bottle the tangy, winey smell of wild concord grapes, or “mustang grapes” as they're called around here. They are one of the few things in the world that taste exactly the way they smell. It's a wild, foresty kind of taste/smell, so completely different from supermarket grapes. Sounds like this one isn't quite it. I really like this one. I agree with Tom that this would make a great water perfume. I have the absolute myself and am looking forward to trying it in the cooler months. On me it doesn't smell like grape lollipops. It is a soft grapy smell though, after the woods and moss disappear. I find it comforting. Very very light sounds just perfect for this time of year! I wouldn't mind reapplying if I had to. Wanted to weigh in on this last week but… work intervened (pesky employment!). “Under the Arbor” sounds fairly vile — the thought of grape candy or grape soda essence mixed with a musty earthiness is about the last thing I'd want to wear. Still, I'd be very curious just to give this a sniff, as I would almost any of the other CBIHP creations. I'm on my way to being a huge fan of Brosius. Which brings me to a general point about CB scents: I find the few I've tried fascinating and highly evocative of feelings and conjuring a setting. They feel like complete fragrance narratives to me — very Proustian (ok, maybe I'm going overboard). Even the scents I haven't tried I'm incredibly curious about. These qualities certainly don't translate into being “wearable”; I almost find them more fascinating for aromatherapy purposes and I'd certainly be more interested in some as home fragrance (many of them are available as such) than as something I'd want on my person. Example: “Memory of Kindness” is interesting, but I would never wear something that green and vegetal. However, I'm in love with “Wild Pansy” and I have a feeling it's going to be my next full retail price(ack!) purchase. I'm also curious — and very wary! — about how these are in the water perfume formulas, so any feedback from others would be appreciated. Does the water formula necessarily translate into being light and not having staying power? Frankly, my biggest beef with some scents lately is how quickly they fall flat — I don't want to douse myself just to make it through the morning at the office (after knocking my commute-mates over the head), and I don't want to reapply so often that I drain a 100ml bottle before I know it! Butting in to say I am a huge fan of Brosius as well, although I didn't care for Under the Arbor. But the water formulas are great, esp. if you're not an oil fan (and I'm not). They are lighter in concentration, obviously, but I use them like body sprays and find the lasting power to be very good. Also have one room spray (Russian Caravan Tea) and wear that as a body spray too.